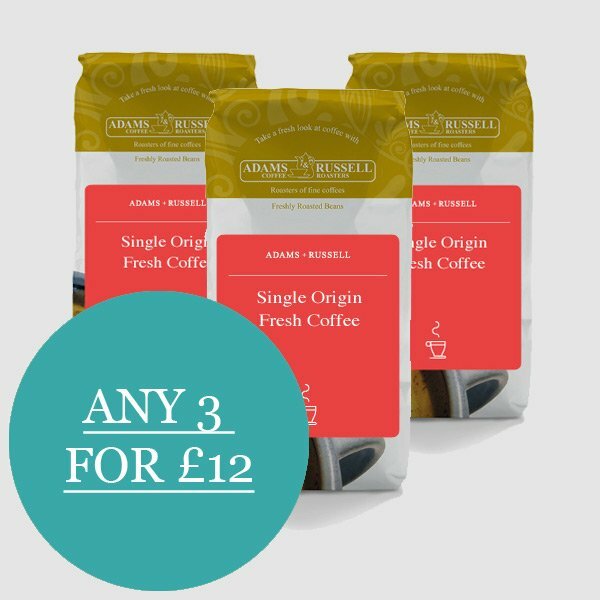 Save 25% by getting 3 bags of coffee for £15. Just select your options below and head over to the checkout. If you want to find out more about each coffee, you can go to our coffee category page here and add your selections from there too. Single origin is a must try for those who want to experience unique flavours and characteristics like no other. It is a fantastic opportunity to get the true taste of coffee from a specific region, without a blend from various other countries. For a coffee fanatic it is exciting to try beans from around the world and compare country to country, which is why we have created this special offer to make it easier to try different single origins. Single origin coffee is beans that are grown from a specific producer, crop or region in one country. This differs to single plantation as these beans have to come from the exact same plantation, not just plantations across the same country. Single origin is not a blend of different countries and can always be traced back to its producer’s geographical location. What characteristics does single origin coffee have? When comparing a blend and single origin, there is a difference in characteristics. The purpose of a blend is to create consistently delicious coffee for a wider audience. Different coffees are carefully selected for our blends, such as our Continental Blend, to give a great tasting cup that appeals to a wide audience. This is why blends are a great choice for cafes, restaurants and businesses. Whereas with single origin, the characteristics are more varied and unique. This type of coffee is individual and comes with its own personal flavours. The method of processing is used to emphasise these exclusive flavours, creating a cup that is unlike any other. Some believe blends to be lower quality because many companies use low quality beans, meaning they favour single origin for high quality. However, neither is better than the other as it depends on the quality of the beans used and your personal taste. If there is a very specific flavour profile you are after, then look through our range of single origins to find one that meets your requirements. If you are looking for a consistent coffee that will please a wide variety of people, a blend may be best. Of course, there are plenty of single origins that are smooth, delicious and consistently high quality, it just takes some testing and tasting to find which is your perfect match. That is why we have introduced the special 3 for £15 offer so customers can easily try some exciting single origin options. Where do I buy single origin coffee beans? As with any coffee, single origin requires quality beans for the flavours to be truly appreciated. Mediocre beans may not give you the full, high-quality experience that single origin has to offer, and may put you off trying them again. It is important to buy from a reputable, well-trusted supplier to make sure you are getting the best for your money. Decent coffee, though not sure it was that recently roasted, it smelt a bit stale. Also it would be good to know in advance what type of roast I was purchasing (light/medium/dark). Thank you for your feedback. I can confirm that we roast our coffee daily and aim to send it out to you when it’s at its most fresh. We do recommend buying beans to ensure maximum freshness. In terms of finding out the roast details, apologies if it’s unclear. We do have a dedicated page for all the coffees on the selection that you can access from the main category page here https://www.adamsandrussell.co.uk/products/coffee/. This is a great way to try out different coffees before taking the plunge and buying a kilo. So far Columbian La Manuela has 8.5 out of 10 (a little sweet) and Ethiopian Sidamo has 9 (very creamy). Love the idea of trying out different coffee. Am currently drinking the Indian Tiger stripe. Not too strong and lovely aroma.